Starting today, if you go to our xG by Game page (also listed at the bottom of this post), you'll notice that there are now two expected goals totals for each team. That's because we have multiple xG models, and they give different results. Crazy, we know. One is called the team expected goals model, and the other the player expected goals model. There are only two simple differences between these models, but they are significant. Penalty kicks are worth less in the team model. Sequential shots get their value diminished in the team model. Greetings one and all as the new season begins in MLS. In case you missed it I published an article on here not to long ago that dives into my Possession with Purpose Indices to include a general introduction on what it is and means as well as some explanations behind the Indices. If you haven't gone through the article before or if you need a refresh click here. This Index is not influenced by previous season results; it's a new year and a fresh/clean slate for teams to build from as they all challenge each other to make the Playoffs. So all you supporters of teams that didn't do so well this past year - fahgetaboutit! Another top performer was Houston - some consider, last year, they were a sleeping giant that simply didn't wake up in time for a solid Playoff run - I do - in their first game this year they burst the flood gates with 4 goals and some solid and superb defense led by a guy I absolutely hated to see leave Portland - David Horst. Some may gaffaw at this but this time last year - before his injury - I thought David had a superb chance to get a wee bit stuck in (some minutes) on some USMNT training like Michael Harrington did this off-season. I still think David has great pedigree as a stand-up defender with great timing and good vision to see gaps and create gaps. So if you are a Houston supporter know that I have a special interest in seeing David do great things. As for reading the diagram - there's a note there to read it from left to right (best to worst). 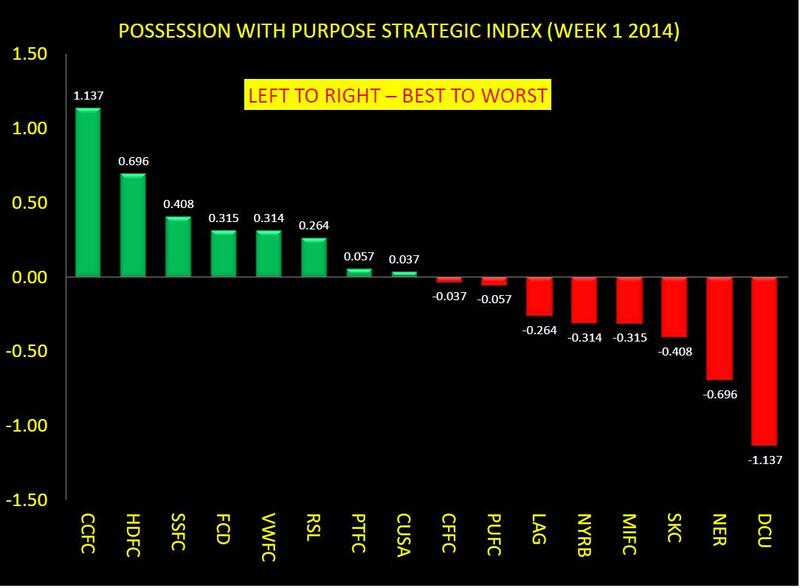 The composite Index is the difference between the team Attacking PWP Index and the team Defending PWP Index. 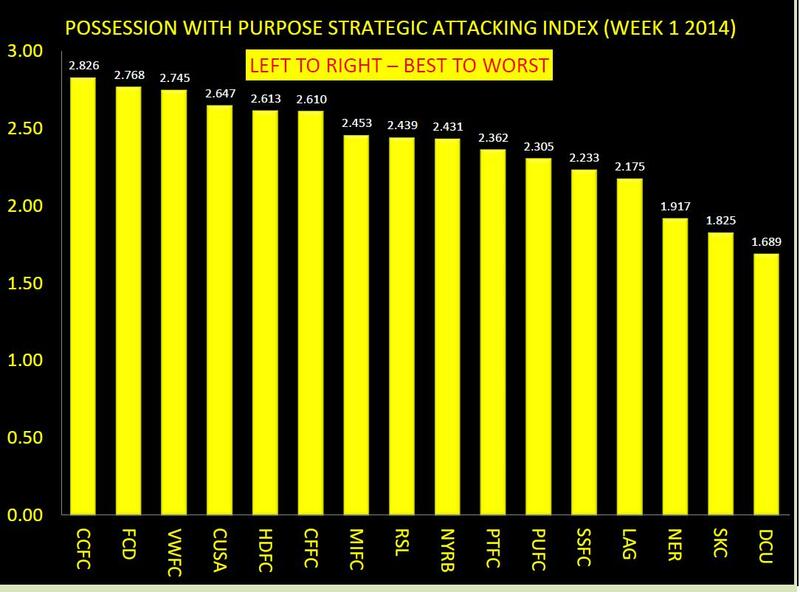 The overall total represents the ratios of success each team had in performing the six basic steps, possession, passing accuracy, penetration, creation, targeting, and scoring a goal. It's not perfect but last year it was very representative. This is the first week and like most things that are measured, to begin with, there may be wide variation in the first 10 or so samples analyzed - so like last year Chivas began with a good start. Does that continue or do we see them tail off - likewise - DC United ended the season near bottom in almost every single PWP category - so far they are right where they left off. Will time show that Eddie Johnson was a good purchase - we'll see. As for the leaders from last year like Real Salt Lake, Sporting KC and Portland. It's no secret now that RSL opened up with a solid three points away to LA Galaxy - is it rude to expect that Robbie Keane will miss another penalty shot this year? How about that torrential downpour in Portland - rain is not unusual for that part of the country - does it rain a bit more on the Timbers this season or will the sun begin to shine as Fernandez, Valeri, Nagbe, Urutti and others really get there gears engaged with what many feel and think might be the most potent attacking system/scheme/player personnel package in the league? In considering what Sporting KC has on their plate early in the season, 5 games in the course of 15 days I think - is it too much to expect that they will show early indication of dominance again? It's no secret that goals scored will heavily influence the outcome of a game - that's to be expected - so those teams that scored a brace or more of goals this early in the season will rate higher than some that didn't score as many goals. Another new feature this year will be a PWP Attacking and Defending Player of the Week - where some key individual statistics are highlighted that helped influence overall team performance. 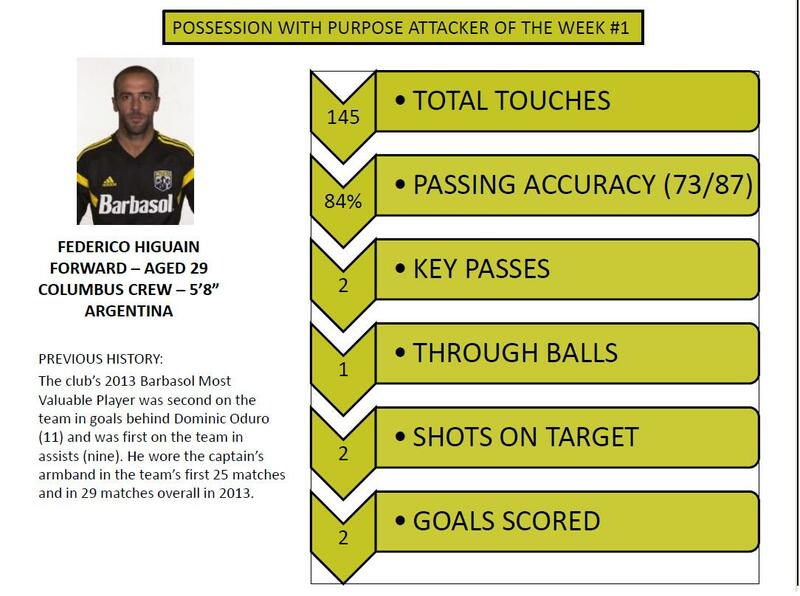 For this past week the PWP Attacking Player of the Week is Federico Higuain. 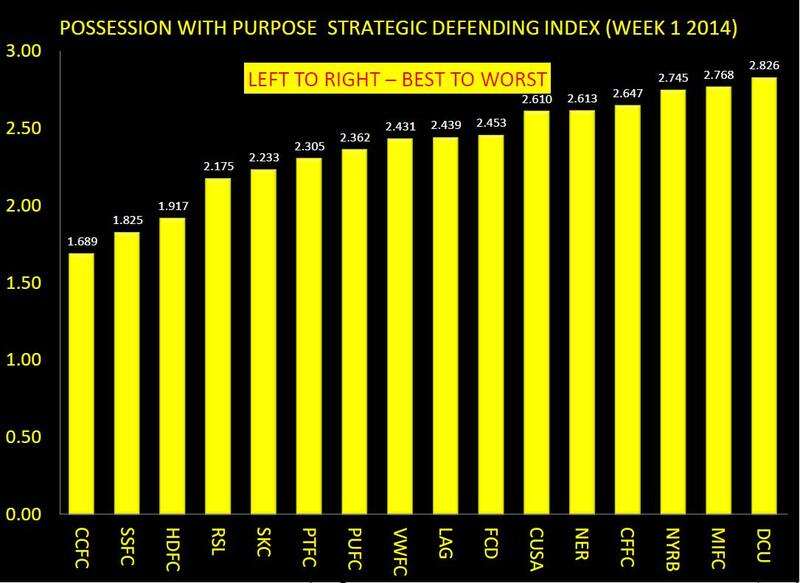 Since this is the first week the top defending team also happens to be the top attacking team. For each specific week (not cummulative) this will be the case - for me there is nothing wrong with that - it takes a solid defense to win games as well. At the end of the season there might be a pattern on who's the top performer, week to week, that is influencing the outcomes of team performances better than others; we'll see. 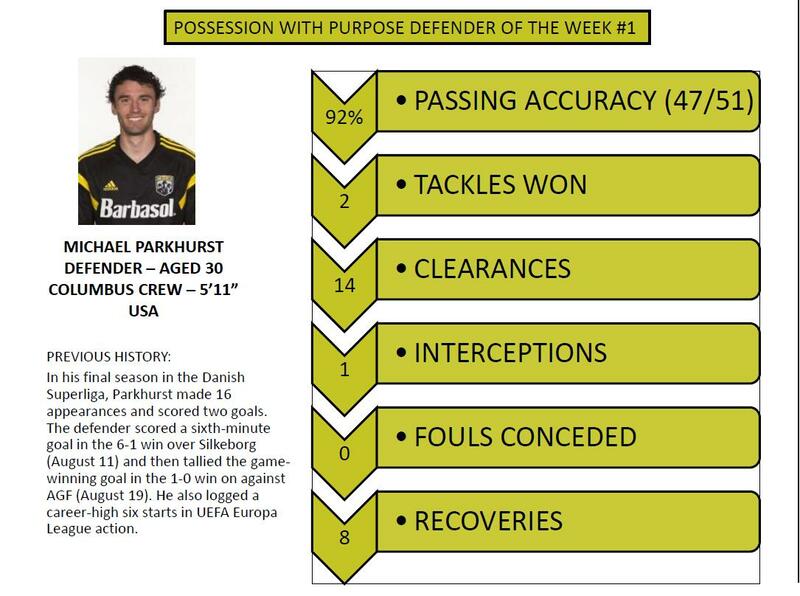 For this past week the PWP Defending Player of the Week is Michael Parkhurst. As the season progresses (right around week 15 or so) I'd offer that the PWP Strategic Composite Index should help paint a picture/expectation on what teams are working towards making the Playoffs and what teams are the doormats. By week 17 last year this Index had accurately predicted 8 of the top 10 teams to make the Playoffs and by seasons end this Index had offered up 9 of the top 10 teams to make the MLS Playoffs; exceeding, in accuracy/prediction both the Squawka.com and Whoscored.com Indices - hopefully that level of predictability shows up again this year. A couple of housekeeping things - my first and foremost source for data remains, like last year, the MLS Chalkboard developed and provided by Opta. Second - as the year continues I will attempt to peel back some more detail on 'defending' by teams in the final third.